If you were not aware, The Neck & Back Pain Institute is the official training facility for the Spinetronics' Antalgic-Trak treatment system. Doctors from around the world attend concentrated certification classes that include a variety of topics on spinal discDr. Bass reviewing patients stats with staff injury, treatment and rehabilitation. Additional topics include practice protocols and procedures of the Antalgic-Trak and its associated technique...KDM therapy or Kinetic Decompression Mobilization. As the inventor of the Antalgic-Trak and co-developer of the KDM treatment technique, Dr Bass oversees the physician training. After a doctor successfully complete the program and meets the required proficiency skills, he or she receives their credentialing and certification. The certification enables them to perform Kinetic Decompression Mobilization (KDM), the official treatment therapy associated with the Antalgic-Trak. 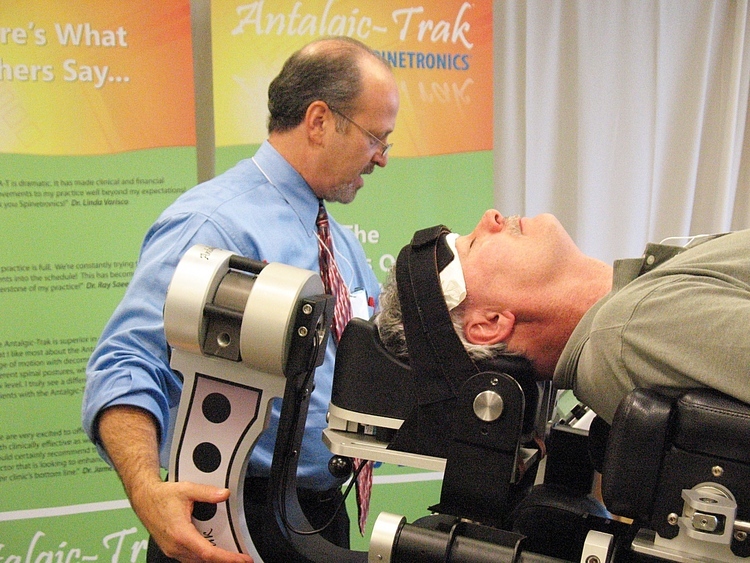 Antalgic-Trak is the only Articulating ROM Spinal Decompression System in the world.